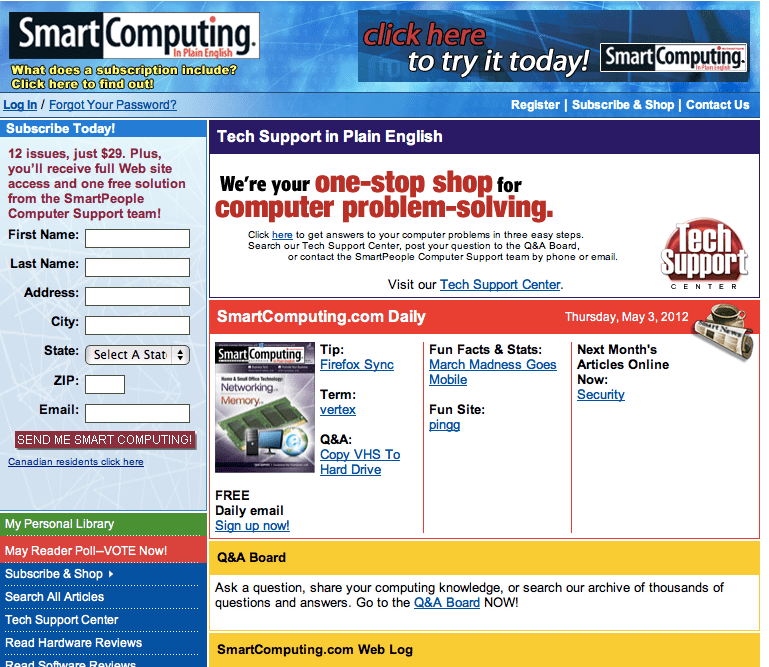 Smart Computing is a computing magazine with a complete coverage of computers and consumer’s electronics. Popular regular features include a Q&A section, which answers readers’ questions; PC Operating Instructions, which focuses on the fundamental skills of using various operating systems; and Quick Studies, which contains how-to articles explaining a single feature of major applications such as Microsoft Word, Microsoft Excel, WordPerfect, and Quicken. Other sections cover the Internet, computing basics, upgrading components, troubleshooting, and more. This site offers online publications for every computer user from novice to advanced and for every market from consumer to business. Whether you are trying to figure out how to use your first PC or are searching for hardware to expand your corporate network, we have you covered. Readers who subscribe to any of this magazine’s publications enjoy access to all the content, thanks to the online archive. In addition, if you want to subscribe to this magazine, you can do so through this website.